Born on September 25, 1871, in New York City, Hildegarde Hawthorne was the daughter and granddaughter of well known writers. Like her father, Julian Hawthorne (1846-1934), and her grandfather, Nathaniel Hawthorne (1804-1864), Hildegarde Hawthorne wrote of strange and supernatural events, and like Nathaniel Hawthorne, she was published in Weird Tales long after her death. Her lone story for the magazine was "Perdita," originally in Harper's New Monthly Magazine in 1897, anthologized in Shapes That Haunt the Dusk in 1907, and reprinted in Weird Tales in Summer 1973. 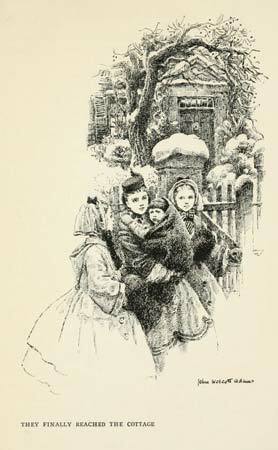 Hildegarde Hawthorne began selling articles to the children's magazine St. Nicholas at age sixteen. During her long and productive career, she wrote many works for children. She also conducted the book review column for St. Nicholas and contributed to the New York Times and New York Tribune. Her last published work was an article for Reader's Digest. Her ghost stories were collected in a volume entitled The Faded Garden in 1985. I'm afraid I don't know its contents. Hildegarde Hawthorne married John Milton Oskison on July 16, 1920, and moved to California. Later she lived in Ridgefield, Connecticut, and passed away in nearby Danbury on December 10, 1952, at age eighty-one. Yet newest, and sweet to learn. William Dean Howells and Henry Mills Alden assembled this collection, Shapes That Haunt the Dusk, for publication in 1907. Hildegarde Hawthorne's "Perdita" is among its contents. Here's an illustration from Girls in Bookland (1916). The artist was John Woolcott Adams. She also wrote Phantom King: The Story of Napoleon's Son, published by D. Appleton-Century Co., 1937. The Faded Garden was published by The Strange Company and edited by Jessica Amanda Salmonson, a noted authority on supernatural fiction of the 19th and early 20th centuries. Salmonson also provides an introduction. 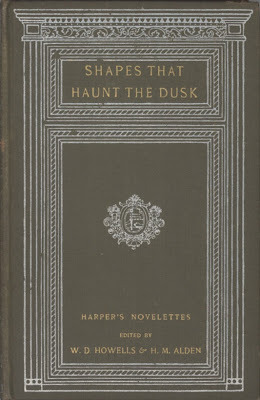 The contents are: “Haunted” (a poem), “Lost” (a poem), “A Legend of Sonora,” “Perdita,” “There Shall Be No Misunderstanding,” “Summons” (a poem), and “Unawares.” The collection also reprints an essay by Hawthorne, “Vision,” as an author’s preface. Hope this helps.